The open workspace: Is it really that bad? Pity the open workspace. It has been criticized by everybody from The Washington Post to Fast Company magazine for creating office distractions, destroying privacy and even making employees sick. So when BCBSNC transitioned out of its well-known Chapel Hill headquarters into renovated space in Durham, why did the company create an open workspace in several of its buildings? When done right, the new style of office fosters creativity and collaboration. These attributes are key to helping us work better in a sometimes turbulent health care world, says Julie Schoenagel, the company’s director of real estate and building services. While many progressive companies are diving into the open office craze, these kinds of workspaces often get a bad rap for wrecking productivity. Those ill-designed workspaces they’re talking about don’t have the key ingredient to make them successful: choice. Workplace experts say you need a variety of space: Open spaces for collaboration, small private offices for focused work alone, various sizes of conference and huddle rooms, and adequate space for socializing and breaks. 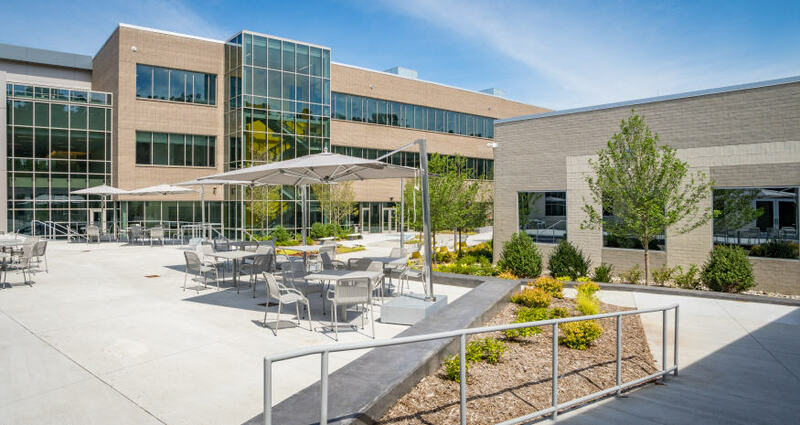 At BCBSNC, a walking trail, covered walkways and courtyards connect the nine buildings throughout our consolidated campus that has lots of options to get work done. The new office space in Durham gives employees the opportunity to sit wherever they choose, depending on the type of work they happen to be doing. The only assigned seating is in private offices for company officers. About 15 percent of the workforce – people in Sales & Marketing, our Project Management Office, Enterprise Analytics and Actuarial, to name a few – has transitioned to the open workspace with no assigned seats. 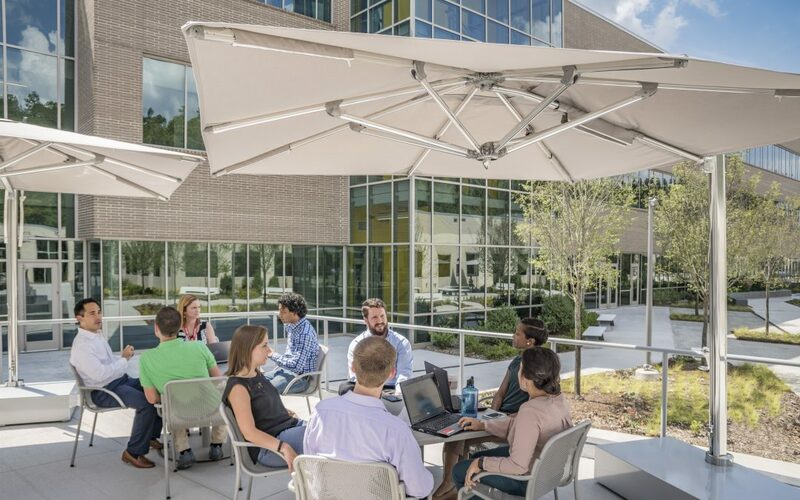 The company’s Real Estate and Facilities Services team, who spearheaded our new way of working, recognized that one size does not fit all and created a variety of spaces with employee needs and work styles in mind. And, according to commercial real estate firm CBRE, BCBSNC is moving in the right direction. As its smart workplace of 2040 infographic shows, employees will be totally in control of where and how they work in the future. 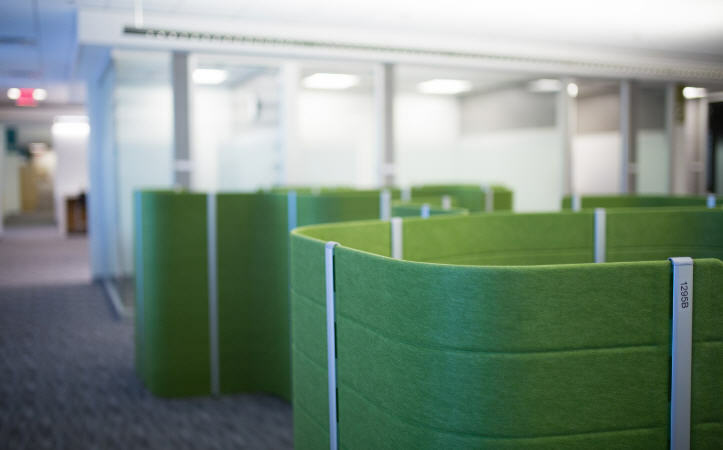 When employees need privacy, there’s more than one option to fill the need for a quiet space. One choice for seclusion from noise and distraction is in a workbay, or “sushi roll,” as employees like to call them. These green private spaces can be found all over campus in designated quiet zones, and they’re made of eco-friendly materials, too. Or, you can step into a focus room – a small office with a door – for a couple hours or take to the treadmill desk in designated private rooms to rack up some steps while working. When you want to collaborate or need a more open, casual environment, that’s available too. These “neighborhoods” of desks with various monitor setups and some sit-to-stand desks give employees their own space next to colleagues working on the same projects or similar work. 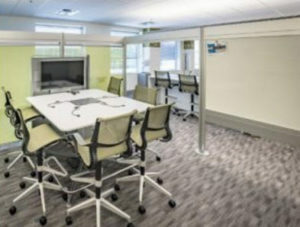 Additional collaboration space at BCBSNC includes high and low tables with electrical and media connections, including large monitors and whiteboards. There’s even workspace outdoors in the courtyard between buildings on the Durham campus – where wireless is still accessible. In a Harvard Business Review (HBR) article from 2014, researchers pointed to how “the most successful work environments provide a range of spaces – an ecosystem – that allow people to choose where and how they get work done.” Equally as important to the choice of physical space is a culture that supports this kind of freedom. Giving employees the flexibility to work where they want wouldn’t be successful without leaders and peers trusting one another to get the work done from wherever they choose. Before 950 BCBSNC employees from a variety of business areas jumped into the open office environment, Schoenagel’s team made sure everything was ready. At BCBSNC, we describe our culture as the Four Cs – caring, creative, collaborative, and committed. It’s in our DNA for how we get work done. And, it’s a primary reason the new workplace is successful. Nicole is a Communications Specialist at BCBSNC. She loves inspiring others through employee stories.